Leading dust control specialists, DBL Engineering can design, manufacture and install a range of products to meet today's demanding standards for fume and dust emissions. With increasingly tougher regulations regarding waste emissions into the atmosphere, the exacting requirements of fume and dust control have become a major challenge for some companies. DBL Engineering is one of Victoria's leading companies in fume and dust control, providing technological solutions to satisfy today's EPA emission standards. DBL Engineering can also offer design advice, manufacture and supply, as well as complete design-an-construct turnkey systems. Dust collectors for high-pressure vacuum systems. All DBL Engineering's dust control products are designed to meet Australian Standards and EPA emission regulations. DBL Engineering is a leading manufacturer of a range of commercial kitchen and laboratory exhaust canopies. Our canopies are designed and manufactured to Australian Standards AS1668.2-1991 specification and are available in 304 and 316 polished stainless steel, galvanised steel poder-coat and other featured-metal finishes. DBL Engineering's purpose-design canopies can be supplied with various extraction designs for specific applications including direct exhaust, vortex supply exhaust, island type, and island type with external glazed sides. Special laboratory fume extraction hoods and velocity slot extraction plenums can also be provided by DBL Engineering. All canopies comply with all current regulations, including the correct installation of vapour-proof lights and dry chemical fire extinguishing systems. Canopies can be produced with feature decorative finishes for specialist retail situations and these include mirror finish stainless steel, beaten copper and brass. 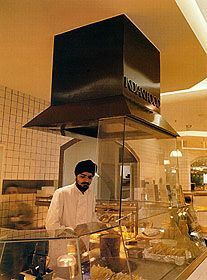 DBL Engineering has supplied canopies to institutional and commercial clients including installations in Daimaru's food court at Melbourne Central's shopping centre, the MCG's Great Southern Stand, William Angliss Food and Catering College, Geelong College, Safeway, Coles and Bi-Lo supermarkets.